This was a very poor Spring generally and without doubt, the worst recorded here in five years. It is hard to pinpoint any real highlight. All species were confidently expected and the rarest record was probably the Marsh Harrier in May. Counts of traditional species such as Meadow Pipit, Linnet and Pied Wagtail, were all considerably well below any previous lowest totals and reasons are hard to ascertain. Fine weather during much of the period, probably resulted in birds flying at greater heights than is usual. There could also have been a more westerly or easterly bias to many migrants flight patterns this year. The same fine conditions also probably accounted for several migrant species attaining new earliest dates, but generally, follow-up records were generally very slow in coming. On the positive side, Spring 2002 produced higher than normal numbers of Chiffchaffs, mostly during the last two weeks of March and the first few days of April. As with most of the early warblers, many occurred as short-staying individuals or brief one-day birds. The general migration highlight of a poor April, was based around a period of good Wheatear and Whinchat arrivals from 23rd onwards, which for a few days, saw birds present on the 28th remain grounded by a period of windy weather caused by a low-pressure system tracking east across the country.This had the effect of halting the arrival of all, but a few hardy migrants. Even Hirundine migration was poor. This continued throughout April giving the poorest daily totals ever and continued what was a miserable Spring. May was (as is so often) very poor for all migrant totals. Hirundines produced some small but slightly more respectable daily counts but Swift migration was non-existant as birds appeared virtually overnight in territory. Wader passage remained somewhat restricted despite favourable conditions and there were records of Whimbrel, Greenshank, Redshank and a late Green Sandpiper. A male Greenland Wheatear was at Eakring Flash on the 17th, the same day as a female Marsh Harrier drifted north-west over Red Hill. Last of the Summer migrants to arrive was a Spotted Flycatcher at the pastures and Eakring Flash briefly on the 31st. There were two periods during the Spring, when migration was halted by bad weather. Both were related to low pressure systems and each centred over different European countries. The picture on the right, taken on April 11th 2002 by Nottingham University's Meteosat satellite, shows the low-pressure system situated over Spain and much of France, which was responsible for halting the progress of migrants between April 9th and 13th. The situation remained very similar for several days, either side of this date, but once gone, allowed good numbers of warblers and other migrants to reach the area from April 14th onwards. The above chart clearly illustrates how (like all species) warbler arrivals were affected by the weather this year. The general arrival pattern into the area, remains similar to those produced in other years, even allowing for the two bad weather breaks. 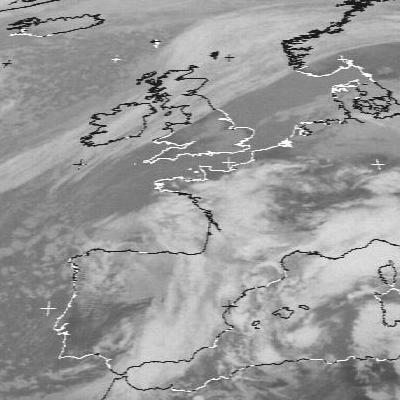 This meteosat picture from April 29th 2002, produced on the left, again shows how the weather completely held up the whole process of Spring migration. With a low situated off the north-east coast of the UK, migrants were again held up across the UK, by a period of strong northerly winds, associated with the low-pressure. This was reflected in the Eakring area, when both Wheatear and Whinchat were forced to remain at Eakring Flash till conditions improved. As with the situation earlier in April, once gone, a ridge of high-pressure enabled the overnight departure of these birds, and also induced a fresh arrival of warblers. Complete data (28/05/2002) shows the populations as they stood going into the breeding season. 2002 represents a big rise in breeding Whitethroat numbers, improving on all previous year's figures. Chiffchaff and Lesser Whitethroat have also shown increases this year. Most other species also produced record total migrant counts. This is quite surprising, considering the poor results achieved for visible migration counts in general this Spring. Many species recorded new earliest arrival dates. These were largely due to the fine and settled April, allowing a generally easy flight over the continent. There was little remarkable to set this Autumn migration period aside from the others of previous years. Most species counts were quite unremarkable, though warblers were noted in increased numbers and Redwings provided the first large-scale passage through the area with two four-figure counts on consecutive dates. Most of the expected waders turned up, with Green Sandpiper and Curlew producing records during late June and early July. Greenshank remained scarce once more, due to the continuing lack of shoreline and species like Dunlin and Ringed Plover were typically brief. The Ringed Plover record was however, the first since 1998. A Ruff was with Lapwings in fields near Eakring Flash on one date, with Whimbrel again producing the expected several records. For the first time, arrivals of migrants on the east coast, failed to produce any inland sightings of the regular species here. A Redstart record at the end of August not coinciding with any such migrant fall. As mentioned in the opening paragraph, most visible migration totals were low, both daily and throughout the entire period. Unfortunately, some breaks in coverage resulted in the lowest totals ever recorded here. The first half of November being particularly affected. Autumn migration is long. From around the third week of June, several species begin to head south and among the most regular are Sand Martins. Birds moved through Eakring Flash on most days in late June, right through July. There were two noticable peaks in Sand Martin migration and most moved through on fine, sunny days in the last week of June. The rarest birds of the Autumn were a Honey Buzzard in the Hare Hill Wood area for over a week, a juvenile Garganey, another Autumn Grasshopper Warbler and a group of four Wood Lark which flew south over Eakring Flash on September 30th. There were poor showings of regular migrants such as Redstart, Wheatear and Whinchat. Two Stonechat records however, were quite typical of the area in recent years. Redwing migration during October and possible reasons creating the "corridor effect"
As mentioned on the October bird news page, this year's main Redwing arrival occurred within a very small migratory "corridor", no more than a few hundred metres across. This corridor ran in an east/west direction, directly over and between Lound Wood and Little Leyfields farm. It did make for easier counting and these were the largest produced by migrant Redwings since recording here began and had been long overdue. Most Winter migrant arrivals occur on a broad scale. These are easily viewable from any single vantage point, and scanning with binoculars will further reveal such passage over more distant parts of the recording area. Such was the concentration of this passage, that even scanning points both north and south with binoculars away from the main route, revealed that less than 1% of Redwings recorded over both days, strayed away from this corridor. If traditional watch points had been used (which they were for certain periods to verify the corridor) then counts would have been vastly lower than those actually derived. When looking at the contours of any OS map, it shows that these flocks were not (it seems) following any particular geographical feature, aside from the fact that this movement did cross the highest point in the recording area. So subtle and relatively smooth are the geographical contours of the land here, that there are no obvious ridges or high-sided valleys which could cause any such concentrations of migrating birds, especially with birds crossing Lincolnshire. Migrant Starlings (and indeed thrushes) have always been recorded crossing the area on a broad-scale, being obvious from any point (either low or high) within the recording area. A possible explanation could lie in the fact that all the birds seen over the 17th and 18th had started from the same point further east, even from the Continent. Certainly some coastal arrivals of thrushes are concentrated to one or two locations. Flocks of birds setting off from the Continent could then be likely to end up arriving at the same points along the English east coast, then continue further inland. There are however, two well-used routes through the area which can be linked to geographical features. The most obvious of these is the low-sided valley following The Beck during it's west/east course through the area. This is most commonly used by finches filtering through the area and can be quite inconspicuous unless purposefully looked for. The other route is a south-westerly passage shown during Autumn by the larger gulls. In this case, many are true migrants, flying at height and following a south-westerly route, roughly running from east of Wellow through a line heading west of Bilsthorpe. This line follows an open valley and birds obviously divert around the highest points of Red Hill. This would not explain the same route followed the following day which was clear of any mist or fog. Geographical explanations also cannot account for this route, as the area is only contoured gently and would not concentrate flocks into one particular path. If this was the case, then it would almost certainly be noted annually. The narrowness of their route over such a small area as this, begins to explain just how some sites in the county can experience large-scale passage whilst others record very little movement. Some could be put down to observer unawareness, but the trend in visible migration watching has slowly increased across Nottinghamshire, as many patch-watchers begin to realise it's importance as an annual avian event when compiling annual reports for their particular site. I have seen a similar migratory bias before here (mainly by Wood Pigeons and Meadow Pipits) although these often manifest themselves far less obviously. Quite often, it has been noticed that the eastern or western-half of the recording area, can produce huge variations in same-day counts of each species. Wood Pigeons (generally moving south or south-west) favour the eastern half of the recording area, with Meadow Pipits (mostly south-easterly passage) producing a more westerly path over the area. 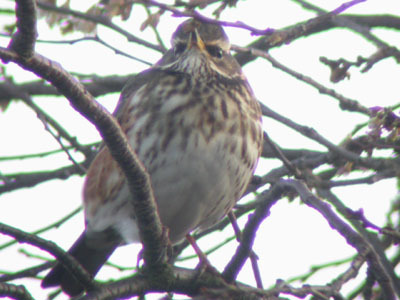 The first Redwings arrived reasonably on time, with three birds appearing on October 10th. By the following day numbers had increased with Eakring Meadows holding 30, with smaller numbers being noted at other sites in the area. Over the following few days, little direct passage was noted, but birds typically continued to appear in small numbers until the main arrival. After October 18th's high count, few migrants were noted, mainly odd birds relocating to other feeding sites. Most unusual however, was the single flock of 29 which actively flew south-west on the late date of December 3rd, in true migrant fashion. The Autumn of 2002 saw record numbers of many warblers pass through the area. By ageing birds present as much as possible on a daily basis, allowed accurate counts to be achieved. These counts may seem very high to some people, especially considering this is just one small part of an eight square kilometre area, but shows just how many birds can pass through any site within the county. The first migrants began appearing during the last week of June. These were mostly odd Chiffchaffs and Willow Warblers, but also included Blackcaps, a species which has always been very scarce along the old hedge at Eakring Flash, until this year. The warbler producing the highest count of any species was the Chiffchaff, with 105 passing through in September alone. This is a massive total in comparison to the same month in all other previous years, but some of this can be attributed to the huge coastal fall of migrants on September 9th. Lesser Whitethroat counts for September were also well up on previous years and numerous combinations of adults/juveniles showed the number of birds involved. With a slightly earlier peak passage timing, Willow Warblers produced virtually the same counts for both July and August. Numbers dwindle rapidly once into the last week of that month, but again, the final count of 149, was well up. Reed Warblers have occurred in September before (1999 and 2001) but three birds this September was an exceptional showing for the area. Migrant Reed Warblers here are generally indicative of a more overall general arrival of migrants. In many instances, they are often accompanied by Sedge Warblers and again, this proved to be the case in 2002. Another true Autumn record of Grasshopper Warbler was the area's third. Grasshopper Warblers are rare in Nottinghamshire after August and no doubt many go overlooked through their secretive and skulking habits. There were two records this Autumn, with one recorded flying along the new hedge at Eakring Flash in July, unusual in circumstances but not date. The later bird was found in a ditch at Penny Pasture Common, Eakring Meadows on September 5th. Garden Warblers are even rarer here. This is personally quite surpising as they were recorded more frequently during my time at King's Mill Reservoir. There were two records this year, with a second record of an early July bird, but one representative of a true Autumn migrant along the old hedge at Earing Flash in August, was a real surprise find.